The Justice Bell started a 5,000-mile tour of all sixty-seven counties in Pennsylvania. 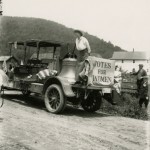 A special truck was designed to carry the bell with suffragists. The truck bed served as a stage for suffragists to address the crowds gathered at each stop. It was an opportunity for women to justify wanting the right to vote. These women began a new chapter in the Liberty Bell’s history, and for themselves. Parades and rallies were held across the state. The suffragists encouraged voters to show support for the referendum by mailing in pledge cards to the PWSA headquarters in Harrisburg. At the end of the tour, Ruschenberger told the Chester County Press, “The bell comes back to its own home after making a complete tour of the State and standing in front of Independence Hall, Philadelphia, only a few yards from the Liberty Bell, of which it is its counterpart.” It was a fitting homecoming. Chester County was the only county in the Philadelphia region to vote in favor of the referendum. Visitors to the Liberty Bell’s home at Independence National Historical Park often encounter an exhibit on the Justice Bell. The Justice Bell can be found at Washington’s Memorial Chapel, in Valley Forge, Pennsylvania. Its story is told through a small exhibit at its base. Because of the Justice Bell, and the suffragists who led the 1915 campaign, women everywhere have a special chapter in the Liberty Bell’s history. -- Text by Holly Jean Holst, a park ranger in interpretation at Independence National Historical Park since 2005. Holst was first introduced to the Justice Bell as an intern for Valley Forge National Historical Park in 2004. Currently she specializes in programs regarding women’s history, specifically the Women’s Suffrage Movement and its connections to National Park Service sites in the Philadelphia area. 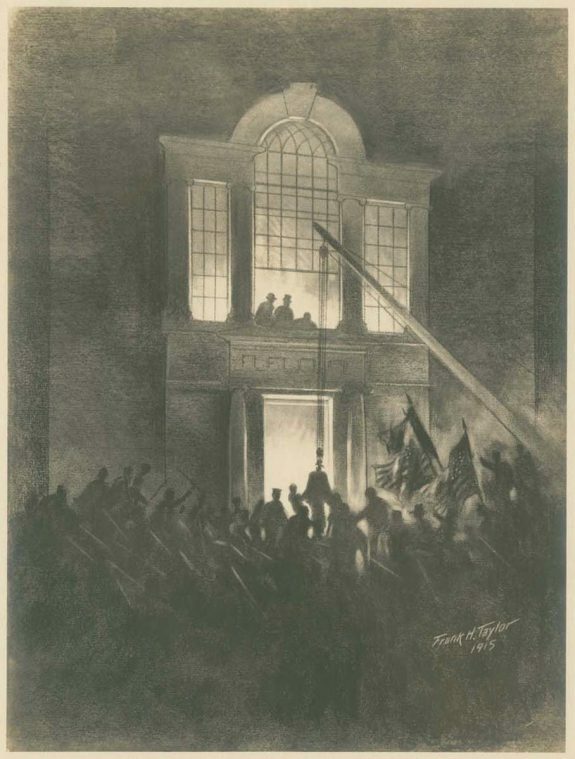 At nightfall on Thanksgiving day in 1915, Philadelphians welcomed the Liberty back to Independence Hall after its cross-country tour. City officials and police officers supervised the move of the flower-decked bell safely back to its resting place, while music played through the crowded streets. The bell had traveled to the Panama-Pacific International Exhibition in San Francisco, which celebrated the completion of the Panama Canal and called attention to that city’s rebuilding efforts since the earthquake of 1906. Philadelphia city representatives had hesitated to let the bell travel in 1915,, worried it would be damaged, but a petition from 500,000 California children helped to persuade Mayor Rudolph Blankenburg to approve the request. The bell began its trip on July 5, 1915, and traveled over 10,000 miles though thirteen states, including Pennsylvania, Ohio, Missouri, Nebraska, Wyoming, Idaho, Washington, and Oregon before it reached its destination in California. This journey was the last time Philadelphians allowed to bell to be transported and exhibited outside the city. It is America’s most famous relic, a nearly sacred totem. Several million people each year make a pilgrimage to see it, many dabbing their eyes as they gaze at it intently. Around the world it is regarded as a universal symbol of freedom. It began inconspicuously as a two-thousand-pound mass of unstable metal; it nearly ended up in the scrap heap; it cracked and lost its voice; it was all but forgotten. But then, gradually, it became a priceless national treasure. For more than a century, the Liberty Bell has captured Americans’ affections and become a stand-in for the nation’s vaunted values: independence, freedom, unalienable rights, and equality. It is virtually a touchstone of American identity because Americans have adopted it, along with the flag, as the symbol of justice, the rule of law, and the guardian of sovereign rights. For many years, it has been cherished in poem, song, and story. The Liberty Bell started out simply as the bell commissioned by the colonial legislature of Pennsylvania to hang in the steeple of the State House in 1752 so that the growing city would have a bell with great carrying power to announce meetings of the legislature and toll for notable events. Cast in London, it cracked at its first testing at which point two artisans in Philadelphia, John Pass and John Stow, recast the bell. Around its brim, it carried words from the Old Testament: “Proclaim LIBERTY throughout all the Land unto all the Inhabitants thereof” (Leviticus, XXV, 10). During the revolutionary era the State House bell became an accomplice in revolutionary politics. It rang out in 1765 to warn of the approach of an English ship sailing up the Delaware River to deliver stamped paper for implementing the hated Stamp Act. It tolled in 1768 to attract thousands gathering to protest the Townshend duties. Again it rang to assemble the citizenry in 1773 for a town meeting to protest the Tea Act. And then again, in 1774, the bell summoned Philadelphians to protest the Coercive Acts. The climax came on July 8, 1776, when the bell pealed and pealed as peopled massed in the State House yard to hear the sheriff of Philadelphia read the Declaration of Independence at high noon. The State House bell had to sit out the British occupation of the city in 1777-78 because Philadelphians, knowing that the British would melt it down and convert it into bullets to be aimed at insurgent Americans, wrestled it down from the State House steeple and carried it by wagon to Allentown. But it was back in the city to toll the British surrender at Yorktown on October 24, 1781, and again to announce the signing of the Treaty of Paris with Great Britain on April 15, 1783. 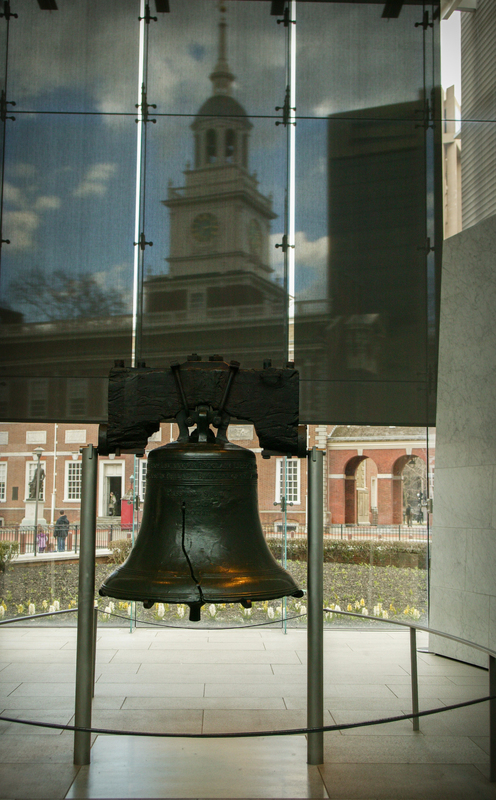 The bell escaped a narrow brush with death in 1812 when Philadelphia officials considered demolishing the rotting hulk of the State House, which had lost its function since the state capital had moved inland to Harrisburg. But the city brokered a deal in 1816 to acquire the old State House, along with the bell, from the state. Eight years later, when the Marquis de Lafayette made his triumphal tour through the United States, the bell began to acquire a new life, largely through the publicity paid to the crumbling State House. Lafayette was received in a redecorated east room, where the Declaration of Independence and the Constitution of 1787 had been signed, amidst massive celebrations and a new wave of interest in the revolutionary era. Now the State House, called Independence Hall, became hallowed ground. But the old bell still awaited its destiny. After almost one hundred years of ringing in important commemorative moments, the Liberty Bell cracked in 1843. 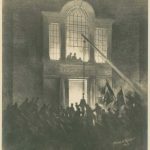 To this day many people believe the hoary legend that it cracked when tolling on July 8, 1835, as the funeral procession of John Marshall, longtime chief justice of the U. S. Supreme Court, passed through the city. It is almost certain, however, that the fissure occurred while it rang in remembrance of Washington’s birthday eight years later. Once damaged, it rested on the first floor of Independence Hall in elaborate settings. The bell did not rest in the public’s admiration. In 1847, the journalist George Lippard wrote a story, “Ring, Grandfather, Ring” for The Saturday Courier that related how an old bellman rang the bell to pronounce independence, after his grandson heard Congress’s resolve. The popular tale, though fictional, was retold as truth and thereafter linked the bell to the Declaration of Independence. Once firmly fixed in the American mind as an avatar of all they believed their nation to be, the Liberty Bell was sent to and fro across the continent. After the Civil War, it became an important messenger of reconciliation between the North and South. Invited by the organizers of New Orleans’s World’s Industrial and Cotton Exposition in 1885, the bell, scrubbed and polished, was carried on an elaborately decorated flat car for a four-day trip to New Orleans. At each stop, people surged forward to touch, stroke, and kiss the bell as the train wended through Pennsylvania, Ohio, Kentucky, Tennessee, Alabama, and Mississippi before finally reaching New Orleans. Once installed, it enthralled visitors for nearly five months, reaching iconic status. Once an antislavery symbol, it now became a symbol of national reconciliation, with its old antislavery message muffled in the process. The next trip was to Chicago’s World’s Columbian Exposition in 1893. On April 29, 1893, thirteen black horses with one hundred equestrial Chicago Hussars of the Illinois National Guard escorted the bell to the “White City”—the hundreds of building erected on the shore of Lake Michigan. The procession stretched for two miles “through crowds of enthusiastic people who cheered the Emblem of Liberty every step of the way—greater homage was never paid King or Queen,” wrote a Chicago newspaper. Most of some 27 million visitors gazed at the bell, displayed in the Pennsylvania building on a circular platform surrounded by a gilt railing built to keep at a distance the multitudes wanting to caress the bell. Shoals of visitors on July 4, 1893, drank in “The Liberty Bell March,” composed by America’s bandmaster John Philip Sousa. By the time of its return to Philadelphia in November 1893, about one-third of the nation had seen it. Flag worship had seized the country in an era of mass immigration, and bell worship now became its cousin. Other trips took the Liberty Bell to expositions in Atlanta, Charleston, St. Louis, and Boston. Never again would the Liberty Bell leave the city. The bell had accepted the laurels of an entire generation of Americans, and the nation’s school children had been taught–in poems, songs, and schoolbook stories–to revere the bell—a bell that belonged to everybody. Making it the indispensable American icon was the marketing of its image in millions of trinkets, postcards, miniature versions, postage stamps, and other memorabilia. On New Year’s Eve in 1924, 1925, and 1926, the tapping of the Liberty Bell, broadcast by radio across the nation, welcomed in the New Year. By this time, there was hardly a sensate American who did not know about the Liberty Bell. The price of immortality was cooptation. Organizations of every political stripe and multiple causes enlisted the Liberty Bell for what they wanted. Among the first since the abolitionists were women suffragists. The Pennsylvania Woman Suffrage Association, campaigning amidst World War I, commissioned a Liberty Bell of their own to tour the state. Dubbing their bell the “Justice Bell,” they added two words to the famous inscription: the bell would not only proclaim liberty throughout the land but “establish justice,” which meant enfranchising women. Other groups followed their lead, including a citizens group called the Loyal Fraternity of the Liberty Bell formed to fight the resurgent Ku Klux Klan in the 1920s, and the “Liberty Bell Ringers” in Michigan dedicated to keeping alive some of the unrealized Progressive reforms. In both World War I and World War II, the U.S. government enlisted the Liberty Bell in “Liberty Bond” campaigns to finance the struggle to protect democracy. Ships and airplanes were named after the Liberty Bell, and the Liberty Bell itself, standing in Independence Hall, formed the backdrop for many patriotic gatherings. At President Franklin Roosevelt’s urging, the bell was tapped for his radio broadcasts to pump up patriotism. The tapping went out over the radio waves throughout the war: tapping “V” for Victory in October 1942 to mark the thirty-first anniversary of the Chinese Republic; for “I am an American Day” on May 16, 1943; for July Fourth in the same year; for the opening of two new war bond drives in September 1943 and January 1944; for a recording to be played to the first wave of soldiers and marines storming the beaches of Normandy in June 1944; for the liberation of the Philippines on March 9, 1945; and tapping out VICTORY in August 1945. In the Cold War, Washington frequently deployed the Liberty Bell as the beacon demonstrating American unity and strength, while it was further immortalized when “Liberty Bell 7” carried Gus Grissom’s into space in 1961. By this time, organizations from far right to far left claimed the Liberty Bell as their own. These ranged from the Liberty Belles, who saturated the country with messages that the Sixteenth Amendment (authorizing the federal income tax) was unconstitutional, to many organizations involved in the civil rights movement who staged sit-ins at the Liberty Bell, to members of the Quebec Separatist Movement that planned to dynamite the Liberty Bell in 1965, and to Earth Day environmentalists thronging the Liberty Bell on its first gathering in 1970. Meanwhile, entrepreneurs happily appropriated the Liberty Bell, plastering its image on everything from skimpy women’s underwear, to cat and dog pillows, to the gigantic image at the Phillies Citizens Bank Park that lights up and rings whenever a hometown baseball player hits a home run. In 1976, to celebrate the Bicentennial of the American Revolution, the National Park Service (which assumed custodianship of the bell, along with Independence Hall, in 1948) moved the Liberty Bell from Independence Hall, where it had rested for more than two centuries, to a glass-and-brick pavilion facing Independence Hall a block away. Then in 2003 it found a new home in a spacious exhibit building at Sixth and Market streets, where visitors today, averaging annually in the early twentieth-first century at about 1.5 million, can see the Liberty Bell’s long and varied history portrayed in words and images. Visitors can throw kisses at the nearly sacred bell, but they cannot touch it. Leach, Roberta J. “Jennie Bradley Roessing and the Fight for Woman Suffrage in Pennsylvania.” The Western Pennsylvania Historical Magazine 67 (1984): 189-211. Nash, Gary B. Liberty Bell. New Haven: Yale University Press, 2010. Nash, Gary B. 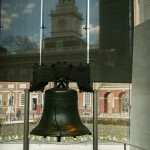 “For Whom Will the Liberty Bell Toll? From Controversy to Collaboration.” George Wright Society Forum, Vol. 21, No. 4 (2004). Rabinowitz, Richard. “The Devil in the (Liberty Bell’s) Belfry: The Transformation of Cultural Practice,” Beyond the Liberty Bell Conference, May 16, 2003. Independence National Historical Park Archives, Third and Walnut Streets, Philadelphia. Justice Bell, Washington Memorial Chapel, Valley Forge, Pa.
Liberty Bell Museum, 622 W. Hamilton Street, Allentown, Pa. The bell has a partial quote from the Bible about “liberty throughout the land” but the full quote implies that a celebration is needed after 50 years. The Colonial fathers took this to celebrate the 50th anniversary of the Charter of Liberties (also know as the Charter of Privileges) which was signed in 1701. The bell was supposed to arrive on the chapter’s 50th anniversary in 1751. It is the Charter of Liberties that gives the bell its name. When I visited the Liberty Bell for the first time in 1979 and I was in awe to be in the same room with it, separated by only a velvet rope line. At the end of the presentation, I was surprised when the line retracted and we were allowed to touch the bell along its rim where people had carved off pieces of the metal. So many had touched it that the sharp edges had become smooth and polished. It is a moment that I shall never forget. I understand why it is no longer allowed, but it is sad that the practice was ended. Can’t believe the Liberty Bell has been there for years. I finally first visited the bell in 2012 (when I was sixteen). The bell is really a good attraction for Philadelphia, especially after it has not been tolled since 1843 after it cracked.